disclaimer: I say "mom body" with love. I had a baby like a billion months ago and still refer to myself as having a mom body. It's ok, just go with it. For reference, I am 5'9" and typically wear a size L/30 in jeans/10 in dresses. All of my real sizes are listed below. Ok, fellow rockers of the Mom Bod, today we're tackling layering trends and I'm doing all of the heavy lifting (so that you don't have to!). I'm re-evaluating my go to fur vest now that I'm post baby, pitting two shearling vests against one another and trying on a cape. To make the comparisons easy, I wore the same top, leggings and boots in every photo and kept all of the layering pieces under $75. Can we all just take a moment to admire the boots? Seriously, I don't know why I let my pride keep me from wide calf boots for so long. They are ah-mazing. This particular pair is, in my opinion, the perfect wide calf boot because the elastic is hidden in a tiny slit on the inside of the leg. Honestly, nothing about them says "my calves look like sausages when squeezed into regular width boots", and for that, I am grateful. I love my fur vest from last year and I'm glad to see that people are still rocking them. This particular vest has a faux leather trim in black that really ups the luxe factor - and thankfully, doesn't require any sort of closure over my ladies, because that ship has sailed. I made sure to seek out a vest that didn't have a ton of weight to it so that one, I don't sweat excessively in it and two, I don't look like a bear headed into hibernation. I am pleased to report that my post baby body can still wear my pre-baby purchase as a layering piece but there is no way I could come even remotely close to closing that bad boy. I still think the fur vest looks on trend and I plan to keep rocking it this season. 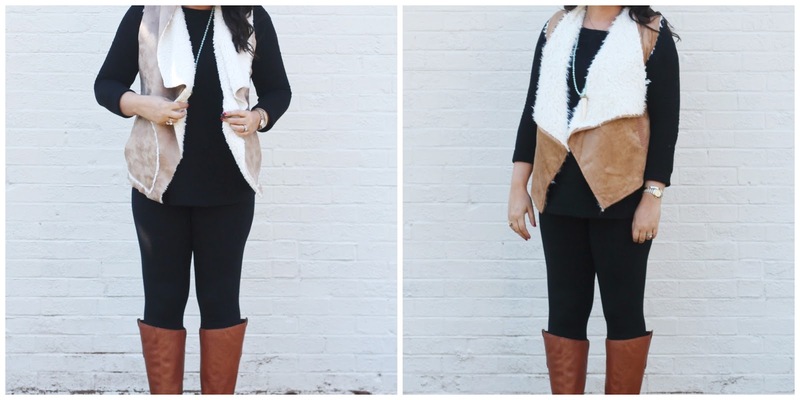 Verdict: anyone can rock this look as long as the vest isn't super puffy. No one needs to add bulk to their lady lumps. I waited until this season to add a shearling vest to my wardrobe. While the shearling look was in last year, I wasn't sure that it was going to be back for a second season. I held out until Black Friday and snagged two different vests at very, very reasonable price points to take for a test run. vest | wearing a size XL because it's from the Juniors Dept. I'm loving this version of a Shearling - it's only $40 and has a great shade to it. The shearling itself looks much more expensive than the price point and the vest can fasten with a tusk button at the front (I'm holding the button and loop in the photo). The shearling lapels are not super floppy so they don't add bulk but they also don't make much of a statement. Definitely take note that this vest is from the Juniors Dept and I'm wearing a XL - if you're tall, you may find that this vest hits a little short, especially if you aren't wearing a monochromatic outfit. If you have big boobies you're going to need to size up - I can fasten this vest over my double d's but it takes a bit of wrangling and isn't exactly comfy. I included this (super awkwardly posed) photo on purpose because one, I wanted to show off the super cute back detail and two, I wanted to show how the shearling on this pieces has a bit of a fuzzy texture to it. The shearling peeks out of the arm holes on this vest and sheds a bit, which ultimately lead to a bit of a fuzzy sweater back. Of course, for $68, we have to have our expectations in check, and a quick roll of a lint roller could alleviate the extra fuzzies, so I still think this guy is a strong contender. Verdict: I wish the sweater back had the sheerling of the traditional style vest! Both price points are so friendly that I think either would be a great addition to a wardrobe. Sadly, I am going to pass on both because I think the length of the traditional/first vest is just a teeny bit short on me and the shearling of the second is just a bit too fuzzy for me. Ok, the cape is a stretch for me. I want to love it, and I think it looks so, so cute with the all black outfit but, in all honesty, I don't know how to work my arms when I'm wearing it. The arm holes are super low and only my forearms stick out. I can't really bend my arms and I can't imagine carrying any bag bigger than a clutch, let alone a tote or diaper bag. There is no way I could gracefully pick up the baby while wearing it so it will for sure be a date night only look. If I consider it strictly outerwear and not a part of my outfit, I think I can get on board. But I will say that this particular cape has bulky shoulders and if you're already a bigger broad like myself, you may find that to be less than flattering. So, yeah, tread lightly on this one. Verdict: surprisingly, I'm keeping it! I have high hopes that date nights will exist in our life and this is the outfit I want to rock when I only need to tote a clutch. The moral of the story is that you can, in fact, wear trendy pieces with a mom body! Just remember to ensure that you aren't adding bulk, are sizing appropriately for your lumps and bumps and that you don't have to invest in super pricey pieces to hop on a trend. Now go forth and layer! 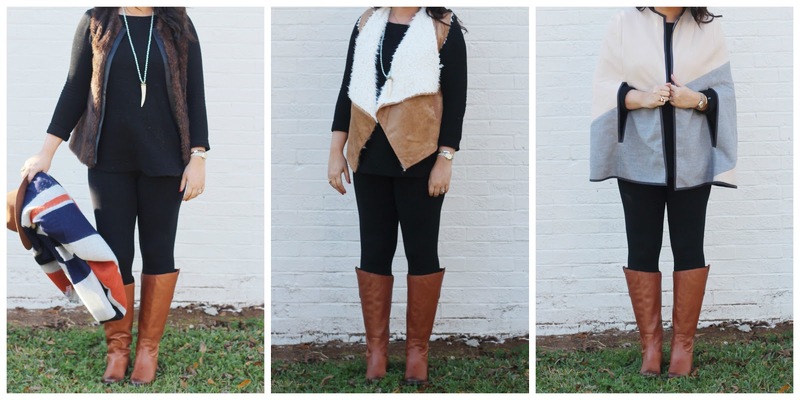 I love love love the fur vest and want one immediately! We are the same size so I love seeing clothes on you!! The cape is super cute but I agree. Clothing has to be practical. And not that anyone cares but I have noticed that a lot of men really, really hate ponchos and capes. I love the cape outfit! Love the cape outfit! I agree not super practical but very chic for fun date nights. I love fur vests but always feel they add heft to me, still haven't found one that has got me all heart eyed emoji. But for the love of it all I keep trying! I also wanted to ask if you were on snapchat? If so, what's your name? I think I like the sweater vest the most but not great that it sheds. I love your boots though! They go with everything! Oh my gosh that cape is GOR-JUSS. You look fabulous in all of these!